"School-based aquaculture programs in Maryland provide hands-on lessons about environmental science". Liz Bowie, Baltimore Sun, January 25, 2018. "Raising fish in schools: project-based science." Chesapeake Quarterly. 40th Anniversary Issue. 40 Years on the Bay. December 2017. Vol. 16, nos. 3 & 4. Aquaculture education projects at participating schools: See details of projects. For example, Westminster High School is raising clownfish, a colorful tropical species displayed in aquariums (for more information, download the article). "Problem-Solving Science Teaching." 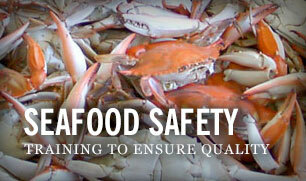 This Maryland Sea Grant video provides an introduction to Aquaculture in Action. Students learn to tackle and solve a slew of research questions and technical problems, ranging from water quality to food supply to fish disease. “The Fishman Cometh”: Article about Aquaculture in Action in Chesapeake Quarterly, Maryland Sea Grant’s magazine. “New Recirculating Aquaculture Technology Comes To Carroll County": South Carroll High School set up a new type of recirculating, anaerobic process using the Anammox process. The system was designed to reduce or eliminate the need for water changes and the mortality of the fish in the system. See a photo gallery of an Aquaculture in Action workshop showing teachers and the fish tanks used in aquaculture education.